Interested in learning more about this open source technology? A developer evangelist outlines his latest (and free!) book on the topic. Do you want to learn how your business can leverage process-driven application delivery? Do you want a step-by-step introduction to setting up JBoss BPM Suite, then coverage of practical and important topics like data modeling, designing business rules and processes, detailed real-world examples, and tips for testing? 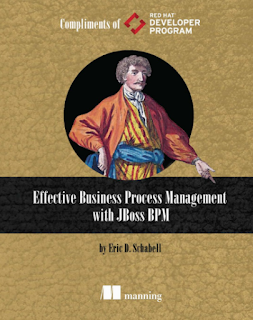 For the last few years, I've been working on putting years of working with JBoss BPM Suite, community projects Drools, and jBPM together in one easy to understand book. In 2017, Red Hat put the first chapter online for free and literally thousands downloaded it starting their journey on the road to delivering the process driven application with JBoss BPM Suite. Many of you have reached out over the years to ask about the completion of this book and where you can get it. The good news is that the book is available and Red Hat's providing ebook downloads for free! While writing this book I've tried to share both the process and the chapters as teasers. 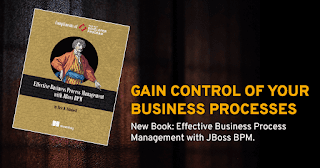 I've posted an excerpt introducing business process management with JBoss BPM, an introduction to the book on medium.com, and an excerpt from the chapter on data modeling. If you want to browse the articles and explore some of these excerpts, check out the publishing feed on my site. Now for the best part, the Red Hat Developers Program is hosting the option for you to download a free ebook copy! I would like to thank everyone over the years that have helped my knowledge grow around JBoss, JBoss BPM, writing, publishing, and managing this final free ebook to help everyone learn how to create and deploy process driving applications using JBoss BPM Suite. Feel free to leave a comment, give me feedback through my social channels or on my sites contact form. I am always happy to chat about process-driven applications and anything JBoss!